In 1997, I was a dorky little seventh-grader who had the luxury of attending card shows rather frequently. Every month or so, a show would hit this little mall about 5 minutes away from me. There would be around 40 tables or so per show, each with their own specialty. Some had strictly vintage while some had only the hottest new inserts. Some sold both wax and singles while others just had a table filled corner to corner with wax boxes that just begged to be ripped. At the time, E-X2000 was the one product that really caught my eye. It was a super-premium product that was a traditionalist’s nightmare. A pack cost about 5-6 dollars and you got TWO cards. Two!! I thought the idea was pretty asinine at first (it really was), but after busting a couple packs, I soon loved the product. Each card was colorful and featured an embossed image of the player against a background window that revealed a sky setting when you held it to the light. Very nice! Stardate 2000 (1:9 packs): If you’ve seen other E-X reviews, then you know about the Stardate sets. These feature an array of prospects and young stars who had about 1 year’s MLB experience or less at the time. I pulled cards of Andy Pettitte and Brooks Kieschnick. Other players in this set include A-Rod, Jeter, and Rolen. These cards have the space theme going for them, but aren’t nearly as busy in design as the following year’s inserts. For the record, I fully endorse Robbie Alomar for the HOF. I just hope the voters can forget how he was with the media and the John Hirschbeck incident. As for the other 2, I guess I just don’t quite see it happening, but we’ll have to wait and see. Credentials (299 produced): Now on to the hit of the box, which came just 2 packs into my break, a Credentials parallel of Ryne Sandberg, numbered 150/299. Rather than the typical colorful border, these cards feature a white border and say “credentials” in small print in the upper-right corner. There are no specified odds on these cards, but I have seen quite a few box breaks in which none were pulled. I was fortunate enough to not only pull one, but of a Hall of Famer as well! There is also a sister parallel to this called Essential Credentials, which feature a blue sparkle-finish and are limited to just 99. Take this Rickey Henderson, for example. What WASN’T Pulled: There is a case hit insert (1:288 packs) entitled “A Cut Above” in which the cards are cut to look like a giant buzzsaw. These cards are nice, but can you imagine trying to put that in a soft sleeve/top loader? Sheesh! Also, in every 500th pack on average was an Emerald Autograph Redemption card for 1 of 6 autographs. In a nutshell, it was Alex Rodriguez, Scott Rolen, Darin Erstad, and 3 total scrubs. It’s not like the redemption would’ve done me any good now anyway. Final Thoughts: I think this just may have been my favorite box break so far. Everything from this box looked awesome and the Sandberg was a very nice hit. If I can find another box or two, I’ll definitely be in pursuit of this set. Two-card packs aside, I can’t think of anything negative to say about this product except that it’s a shame cards aren’t made like this anymore. Base cards: In this box, I received 45 base cards with no duplicates, which was 1 more than the 44 I received from Box 1. One of the packs from Box 2 contained an extra card. In a 2-card pack, I received 2 inserts and 1 base card. Between the 2 boxes, I have 79 total cards out of the 101 in the set and 10 duplicates (which includes that Wood EXCH). If you have any of these laying around, please let me know and I will e-mail you a wantlist. I want to finish this set out. I assure you, I will NOT be opening any more boxes of this crap E-X2001. Stardate 2001 (1:12 packs): Box 1 yielded cards of Jaret Wright and Richard Hidalgo. Box 2 yielded cards of Jaret Wright (again!) and Jose Cruz, Jr. Well, they were hot back then anyway. Just a couple more dollar-inserts for the tradebox. Cheap Seat Treats (1:24 packs): The first box yielded a card of Vladimir Guerrero, which I promptly traded. 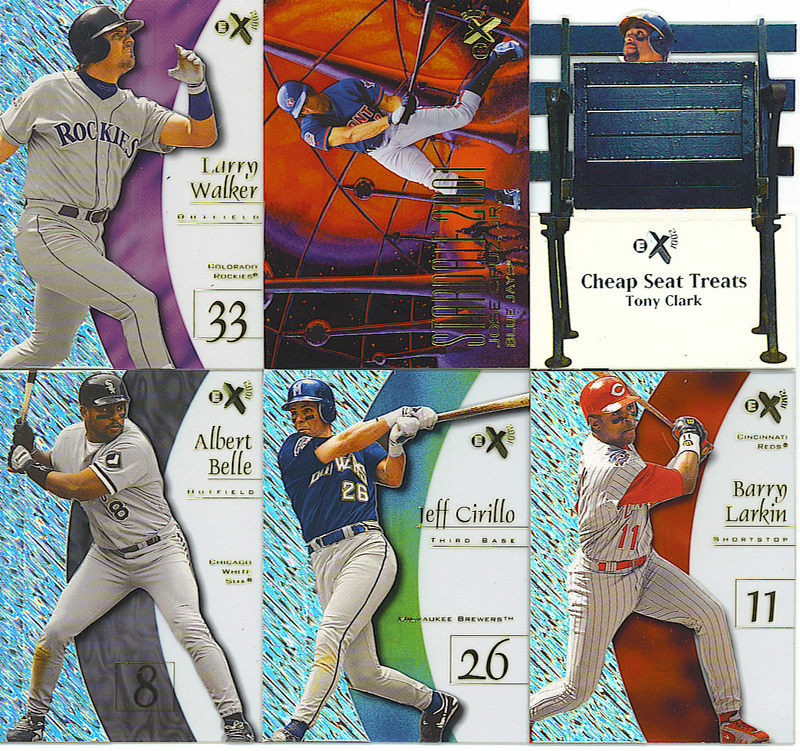 This time, I pulled 2 of these inserts: Scott Rolen and Tony Clark. In some bizarre twist, both of these came from the same exact pack, along with a base card of Chipper Jones. Hmm, so it was a ‘hot pack’ and featured the hottest hitter in baseball. Interesting. As far as luck went, that would be all from this box. Final Thoughts: Fortunately, this box was once again available for cheap. Even though I pulled an extra insert this time, it was still a pretty pedestrian box overall (no autographs, credentials, etc.). This was probably one of those products that was better to open by the case, rather than the box, but they can’t all be winners. I suggest that if you decide to open some of this product, get more than 1 box if possible. They’re cheap enough, it’ll take a few boxes to make a set, and the bigger hits seem to fall in every few boxes or so anyway. Plus, if you get any duplicates, be sure to contact me! 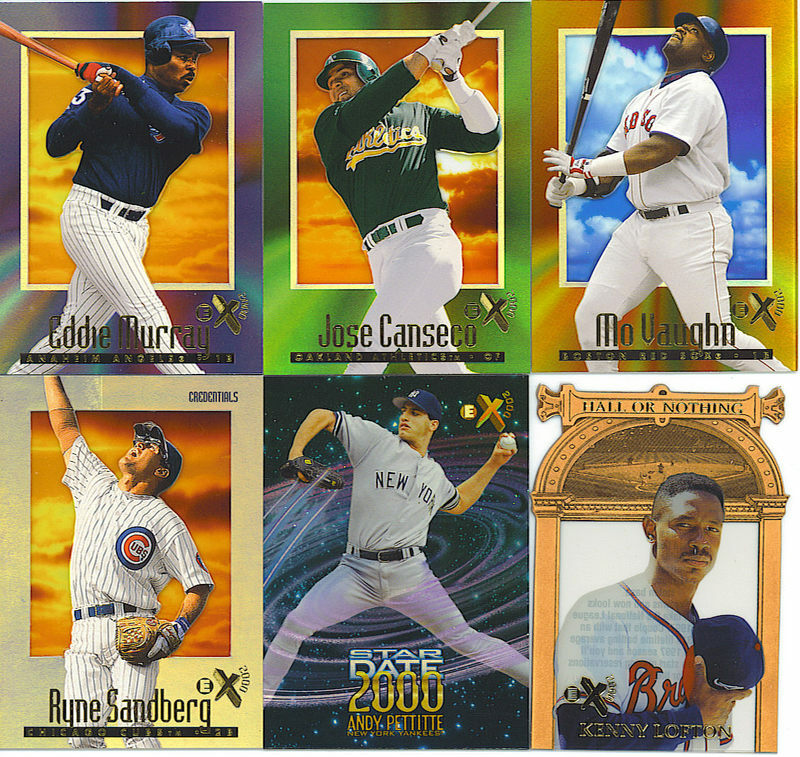 Base cards: Compared to other years, this E-X set has a very short base set. There are only 60 basic veteran cards, followed by another 30 prospect cards. Each prospect card is numbered to 3499. The base cards are not clear like they were in the couple previous years, but are still very colorful, have a refractor-like front, and look very sharp. I received 57 of 60 cards to the base set with 6 duplicates and 2 prospects (Danys Baez: 3493/3499 and Brad Penny: 0904/3499). I already had the base set finished before opening this box, but if anyone can help me finish this second set, it’d be greatly appreciated. The cards I am missing are 1, 6, and 22. Generation E-X: The most common insert in this product is Generation E-X. They are found 1 in every 8 packs. These cards feature a black background with a streak of red near the top. 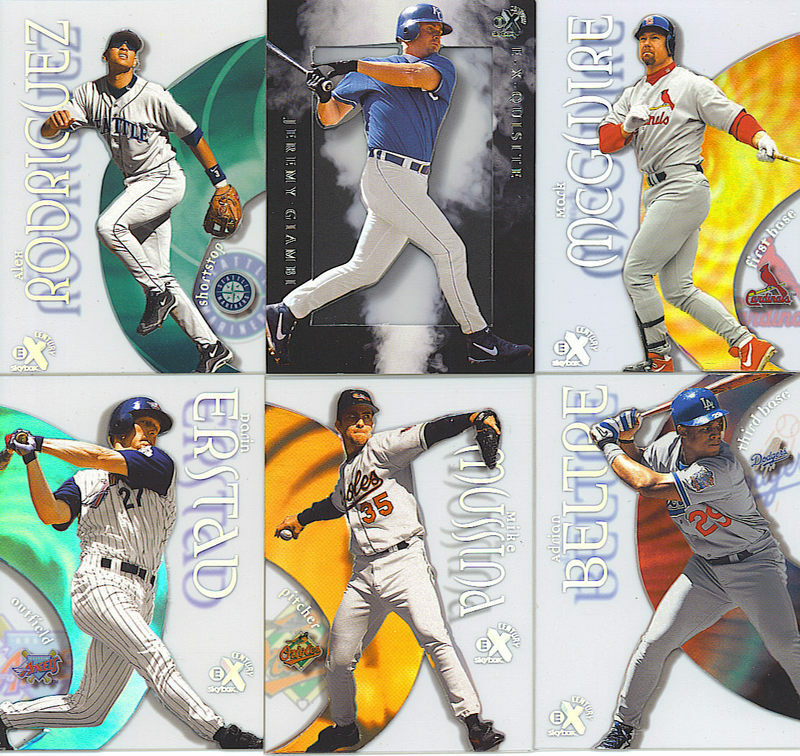 Originally, I thought this was an insert set just for prospects, but Derek Jeter, Nomar Garciaparra, and Alex Rodriguez (who were already stars) were included so….I guess the theme was stars under the age of 30 or something?! I have no idea. I received Alfonso Soriano, Tim Hudson, and Adam Piatt. Well, 2 of those 3 became successful big-leaguers. Not bad. 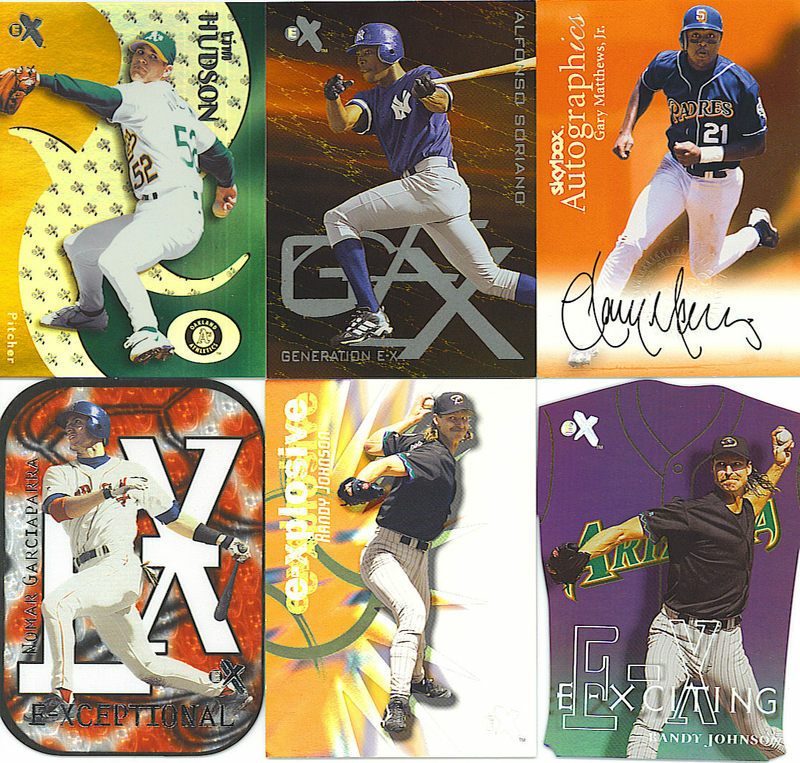 E-XCiting: Here we have a unique insert set in which each card is die-cut and made to resemble the player’s uniform. These are seeded 1 in every 24 packs and look AWESOME. I pulled a Randy Johnson card. You gotta love these kind of “outside the box” type of inserts. The name is appropriate as well. E-Xplosive: Alright, so this one isn’t quite as exciting, but is still pretty cool nevertheless. These cards feature an explosion graphic and are limited to 2499. Once again, I got The Big Unit, numbered 1832/2499. On a side note, there seems to be a trend with me pulling inserts of the same player in the same box. E-Xceptional: This is my personal favorite insert set. These card feature the same technology used in the “jambalaya” inserts in basketball (although these aren’t nearly as rare). There are 15 players in this set and each comes in 3 different colors. The common type is red and is numbered to 1999. The uncommon type is green and is numbered to 999. The rarest type is blue and is numbered to just 250! I pulled a red version of Nomar Garciaparra numbered 1006/1999. I may try to put at least the red set together one of these days. I love the looks of these! Autographics: Last but not least is the well-known Autographics set. Altogether, 133 cards were randomly inserted into 5 different Skybox products: E-X, Skybox, Skybox Dominion, Skybox Impact, and Metal. The odds of finding an Autographics card varied in each product. In the case of E-X, they were seeded 1 in every 24 packs, the most generous odds of the bunch. There is also a purple foil parallel limited to just 50, but I did not receive one of these. My autograph was of “Little Sarge” Gary Matthews, Jr. This wasn’t quite as good as the Andruw I mentioned in my last post, but at least it was someone I’ve heard of. As you can imagine, there are some HUGE names in this set. There’s one thing I can’t understand though. Apparently, the Mark Bellhorn autograph from this set has the same BV as the Tony Gwynn and Frank Thomas! I guess some people REALLY wanted it for their ’04 Red Sox roster set? In closing, boxes of 2000 E-X aren’t exactly the easiest ones to find. It took quite a bit of searching, but in the end, I was pretty satisfied with my box. If you are able to find a box (that’s not hideously overpriced), I’d say it’s definitely worth a shot. You’ll probably come close to completing a set and you’ll find an array of cards that look incredible. You’re pretty much guaranteed to hit an autograph, perhaps of one of the game’s top stars? If you’re lucky, you can pull a Genuine Coverage card, which could feature a jersey swatch from Ripken, A-Rod, Jeter, or Bonds, among others. And if you’re real lucky, an Essential Credential parallel could be awaiting you, like this one of Derek Jeter. The possibilities are seemingly endless so GOOD LUCK! 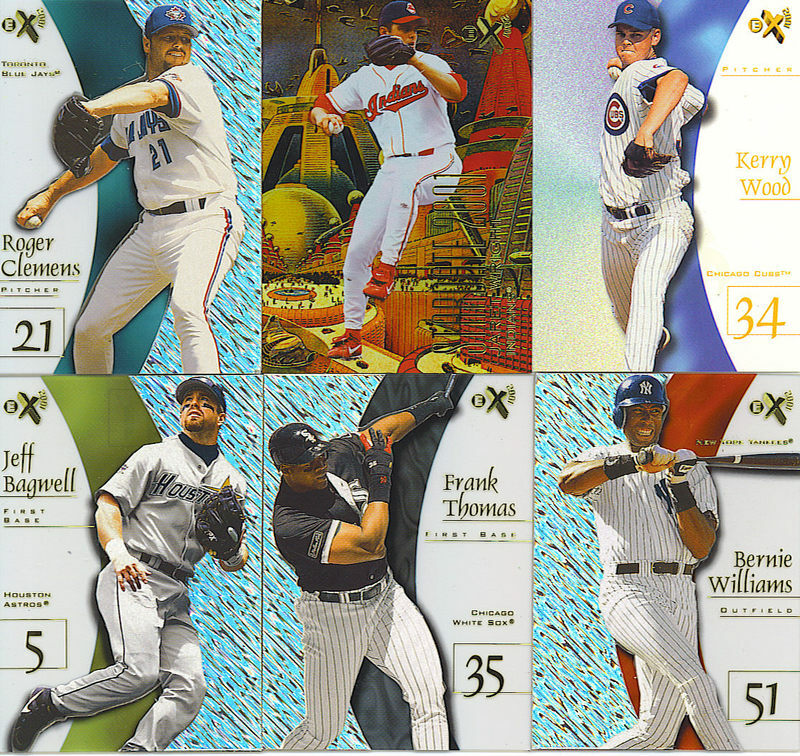 Base cards: The base set is comprised of cards 1-100, and then there’s an extra card of Kerry Wood, which is listed as card 101. Apparently, the Kerry Wood base card was available only through a redemption, seeded 1 in 50 packs. I’m not sure about the story behind this card, but apparently the complete set includes either the Wood base card or its redemption. I pulled one of these redemption cards in my box. I also pulled 44 other regular base cards with NO dupes (which is always a plus). Unfortunately, I didn’t get much else in this box. Star Date 2001: Seeded 2 per box, these futuristic space-themed cards may remind some of the 1994 Ultra Rising Star set. I got cards of Jaret Wright and Richard HIdalgo. No cards in this set book for over $3 though, with Magglio Ordonez being the biggest name in it. Cheap Seat Treats: Here’s yet another cool insert from Fleer. They were a die-cut insert made to look like a stadium seat. The “seat” actually folds out to reveal the player’s body. This set featured guys who could balls into those seats, such as Frank Thomas, Andruw Jones, Albert Belle, and so on. I pulled a Vladimir Guerrero, but traded it to one of the finest traders on The Bench, robwes207. Below is a link to what these inserts look like: Cheap Seat Insert. As always, thanks for the read and thanks for supporting this blog!